Agave’s Lined Up Like Soldiers In Formation! 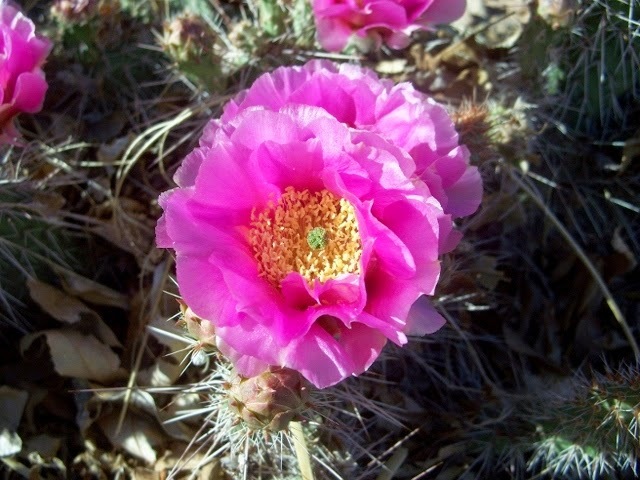 We propagate native cacti for your low water landscape areas! These cacti thrive in full sun with only occasional watering. They are winter hardy to our area. As long as they are planted in the ground and not left in small containers above ground they do very well. A problem can arise if they are left in small containers above ground during winter. 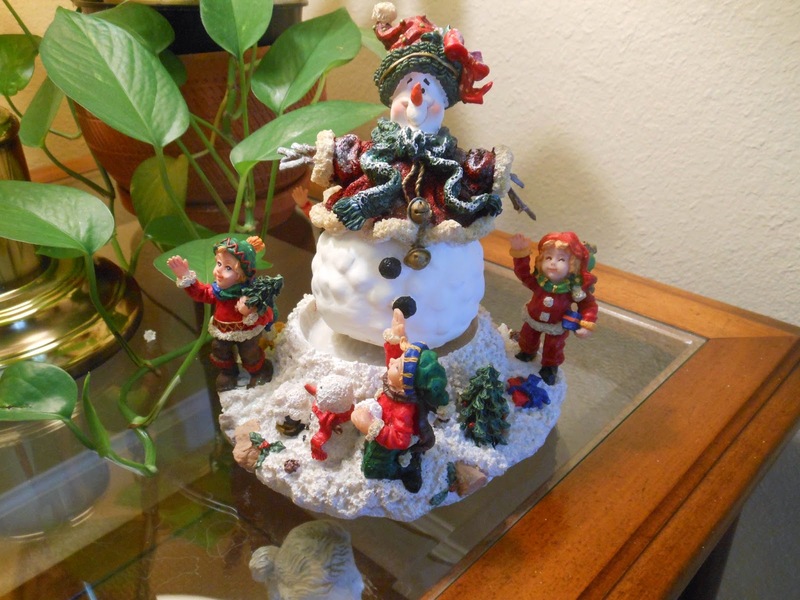 This can happen if we experience a particularly cold winter. 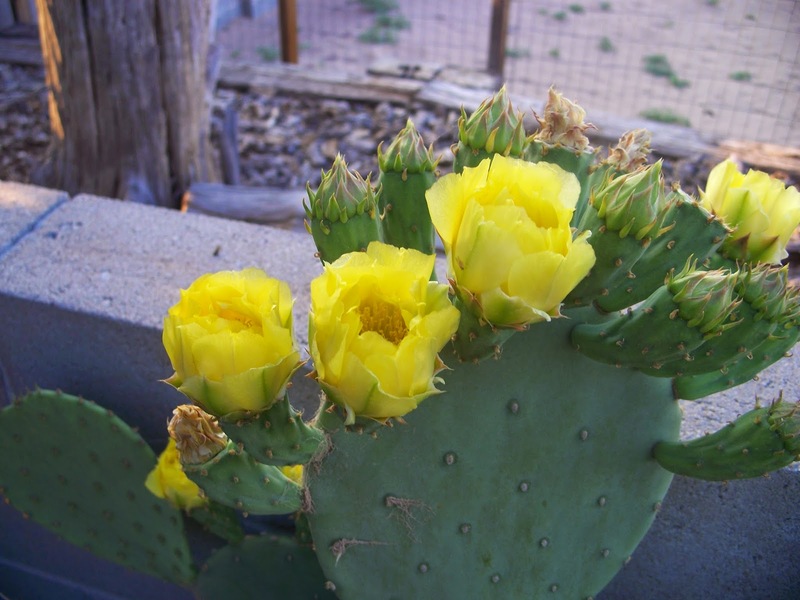 Containerized cacti left above ground during winter can experience root damage or death. This can occur if the container freezes solid. This is something we have learned over the years and so we bring all of our containerized cacti into an unheated greenhouse during winter. This affords them a little extra protection from the elements. When protected during winter we rarely experience any losses due to winter cold. 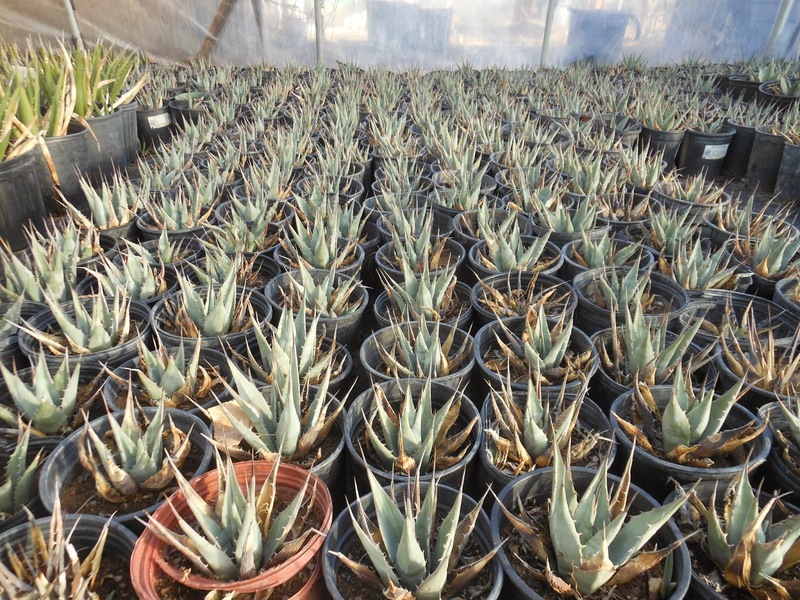 The photo below shows some of our New Mexico Agaves all lined up in the greenhouse like soldiers in formation! When Planting, Dig A Square Hole! especially, if your soil is a clay or compacted soil. Most of us dig round holes when planting perhaps to match the containers shape. the sides of the hole as you pull back to left a shovel full of dirt. Whatever shape hole you dig you will end up with compressed and hardened walls. Roots will follow the path of least resistance as they grow outward in the planting hole. The path of least resistance will be the fill dirt area of the hole. When the roots encounter the planting hole wall it is a harder surface (undisturbed) and the roots may have a tendency to follow the wall surface rather than penetrate through it. 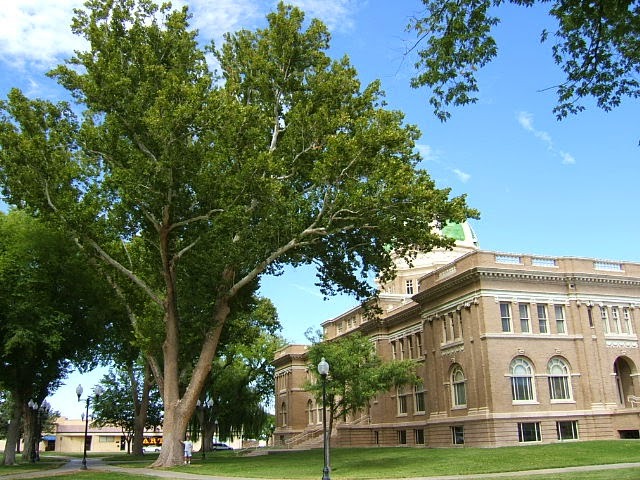 If they do your tree or shrub may become root bound in the planting hole over time. A square hole still has the harder wall surface as found in a round hole but with a square hole there are cracks and crevices. These cracks and crevices provide places where roots can get stuck and exit the planting hole. cracks and crevices for root exit. to roughen up the walls of the planting hole. Use about 2 quarts of hydrogen peroxide per planting hole. Pour it liberally down the wall surfaces. It will begin to bubble. As it does so it loosens the planting walls surface. before putting your tree or shrub into the hole. The shape of the planting hole is less important in sandy soils. Have You Considered A Site Evaluation or Consultation? Are you are planning a new landscape or adding to an existing one? if they are site or climate appropriate? If so, then consider a Site Evaluation or Consultation? and help you answer the numerous planting and care questions that can arise. Under and Above Ground Utilities. Septic Tank and Leach Field Locations. Plant Purpose: Shade, Specimen, Flowers, etc. Acidic or Alkaline Soil Requiring Plants. For Trees And Shrubs Based Upon Your Desires Or Requirements For The Site? Trees That Please Nursery Wishes You A Merry Christmas! 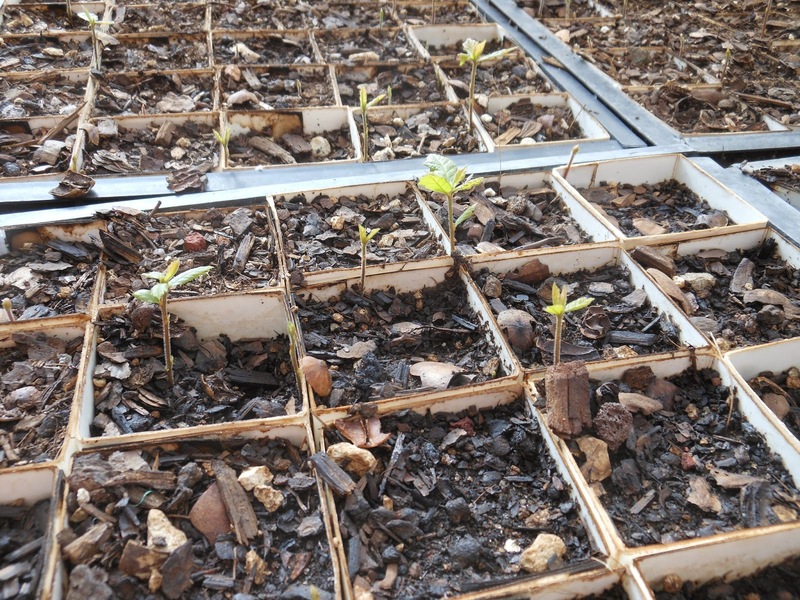 Gambel Oak Seedlings During The Holidays at Trees That Please Nursery. Each year we harvest Gambel Oak Acorns from trees planted in isolation or from native populations from around the state of New Mexico. Acorns are either planted immediately or refrigerated until planting. In either case, acorns are in the soil by October or November where they germinate and grow overwinter in seed flats in one of our heated greenhouses. In the photo below (Look Closely) you see young Gambel Oaks on Christmas Eve at the nursery. These young seedlings will become our future tree stock in 3-4 years depending upon vigor. This is just one of the many tree species we propagate annually. 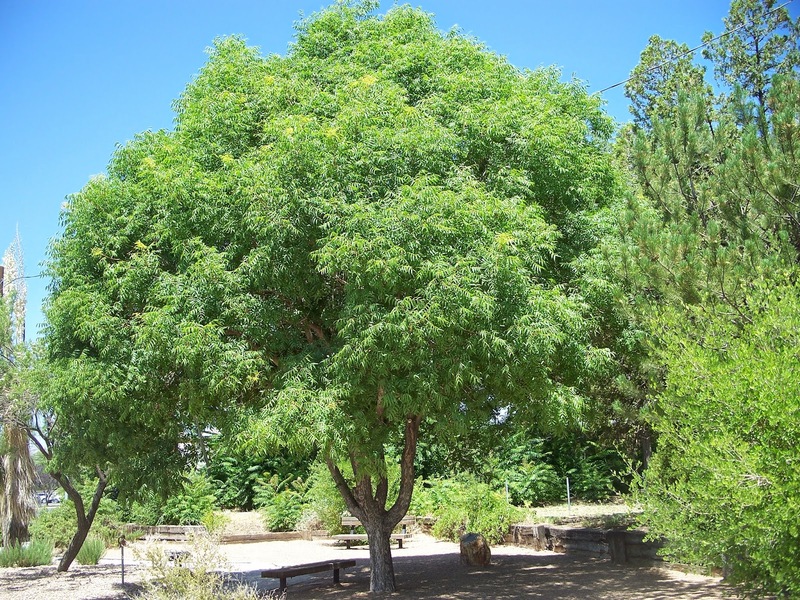 Trees That Please Nursery grows plants that thrive in the desert southwest. flowering perennials, seasonal herbs and veggies, as well as indoor houseplants. We have plants to fit your space large or small! dependent upon structures in the landscape. We have low water and high water requiring plants depending upon your needs. We provide planting instructions and care guides to help you succeed! We can deliver and plant if you so desire! so are already acclimate to our high temperatures and low rainfall. in your home or business landscape! 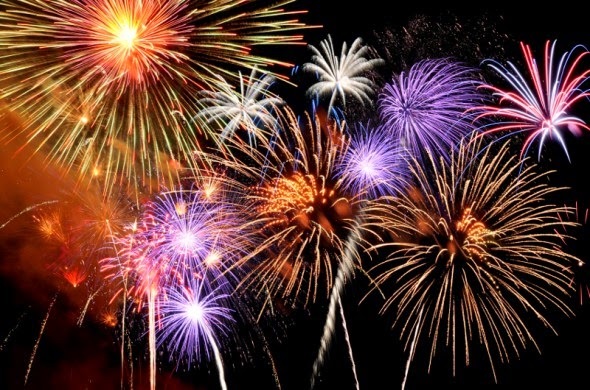 Open Daily Till 4:00 PM! and our staff is here to help you with great gift ideas! Stop By The Nursery and Chat with our staff. and if we don't have an answer we'll work hard to find one! New Zealand White Clover (Trifolium repens) is a perennial nitrogen fixing legume that reaches about 8-12 inches in height. New Zealand White Clover is more tolerant of heat and drought than larger clovers, is more vigorous, and tolerates a wide range of soils. New Zealand White Clover forms a symbiotic relationship with nitrogen fixing soil bacteria called Rhizobium trifolii. Rhizobium bacteria are found in root nodules of clover and other legumes. The Rhizobium bacteria fix atmospheric nitrogen into ammonium that the plant uses for growth and development. The plant in turn provides a suitable growth environment (root nodule) as well as other nutrients such as carbohydrates and protein. New Zealand White Clover is used as green manure as it fixes up to 170 pounds of nitrogen per acre. Excess nitrogen is released into the surrounding soil where associated plants use it for growth and development. 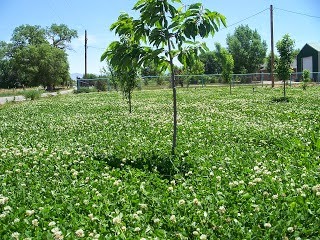 Local Orchards, Valencia County Extension Service, and Homeowners use New Zealand White Clover under their orchards or vineyards to provide natural organic nitrogen and reduce or eliminate the need to buy inorganic nitrogen fertilizers. 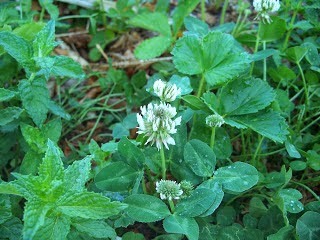 New Zealand White Clover is also used as “living mulch”. Like other mulches a surface crop of New Zealand White Clover protects the soil from drying, high temperatures, chokes out weeds, and the flowers attract beneficial insects like honeybees (photo). New Zealand White Clover will grow on most soils but requires regular moisture for growth. This is one reason it is well suited as an orchard or vineyard cover crop because fruit crops require regular moisture for production. 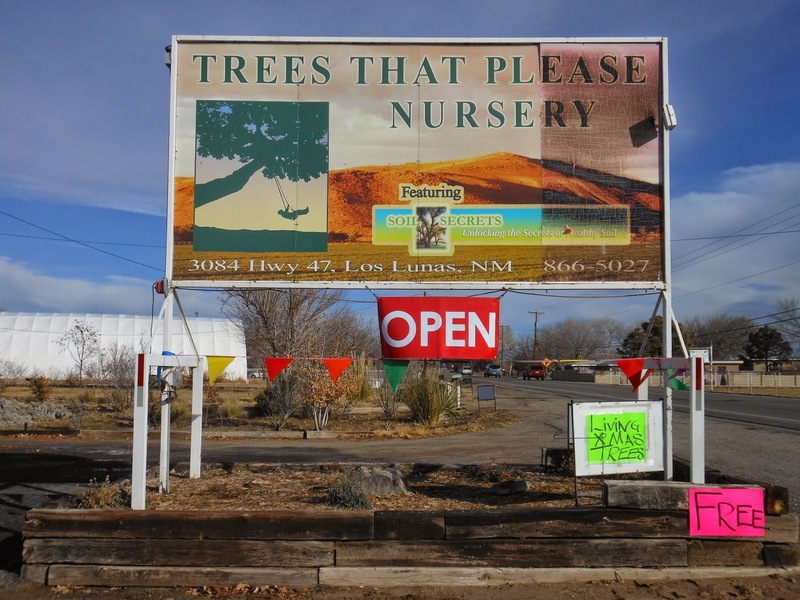 Trees That Please Nursery Gift Certificates! Holiday Shopping At The Nursery! Stop And Enjoy The Leaf Litter!